Naughty Dog's 3rd entry in the Uncharted franchise hits all the right notes; let me just get that out of the way. 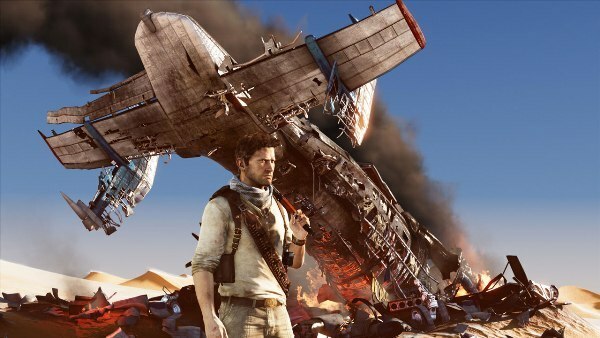 Actually, the only thing that might surprise you about Uncharted 3’s relentless roller coaster ride is how “safe” Naughty Dog decided to play it; you won’t be able to find any ground breaking innovations or game changing mechanics here. Uncharted 2 set the bar for modern Action Adventure games but unfortunately, the bar was set way too high - Uncharted 3 touched the bar but didn't manage to raise it. A constant sense of "been there ,done that" seem to plague my entire playthrough - the almost perfect blend of gunplay, puzzle solving and platforming. Maybe I'm jaded, maybe I'm asking for too much. Even though the game is not superior to its predecessor. I’m still happy to play another sequel that manages to hit all the same notes.. The gameplay of Uncharted 3 has not changed since the 1st game, the gunplay, puzzle solving and platforming feels familiar with a few significant quality of life improvements here and there. Drake will now make use of objects in the environment via a context sensitive button press, this minor improvement makes the close combat vastly more cinematic and the CQC segments more kinetic and "fun". The stealth sections have been tweaked so it flows smoother compared to the last game. Enemies still can take an unrealistic amount of bullets which gets frustrating in the later parts of the game especially when the game starts throwing more enemies at you. And like the last game, Uncharted 3 also excels at letting you interact with its lushly detailed environments in ways you never expected. It’s really impressive to how an organic looking scene in the game's multitude of locales can break into a series of conveniently placed handholds. The set pieces in this game are of epic proportion, some might say they are at the point of perfection. Think back to Uncharted 2, the battle with the HIND chopper in Nepal and the battle on top of a speeding train. Uncharted 3 delivers the same jaw-dropping set-pieces the like you have never seen outside of Hollywood blockbusters. The seamless transition from gameplay to set-piece/cutscene was perfect, never once was there a break in the action. Naughty Dog created an incredible game that is Uncharted 2, taking an action game and elevating it to a cinematic height - a true action adventure game. That game set the bar so perilously high that the sequel could only meet the bar but not surpass it. The Uncharted series have raised the bar so high, I'm beginning to wonder if there's any innovation left in this particular genre. However, that’s a question only time will answer, but right now, you should spend some time playing Uncharted 3.